What is NUV and CaK line filters? CaK line filters are something new to the Amateur Solar Astronomy and they are rare to be found in our hands. This is because amateur astronomers like more to view the Sun from the eyepiece than to image the Sun through their telescopes. CaK line filters are not the best choice for those who seek the pleasure of visual observations, this is because those filters are centered at a part of the spectrum almost invisible in the human eye. That part of the spectrum is called : NUV (near ultra violet). What most people seem to not know is that with those filters (if used with a camera) you can observe many features of the Chromosphere, like the prominences and flares. In the next lines you are going to find a few things on how to use those filters with a camera and how to produce schientific valuable images. Theese days there are 2 filters at CaK line that are cheap and easy to use. For our observations and imaging sessions we used the CaK line filter of "Lunt Solar Telescopes" that the University of Athens (Faculty of Physics) use. This filter is a diagonal with the filter assembly and a BF600 secondary filter with a bandpass of >2.4 Angstrom. This filter was attached to a 60mm refractor f/600mm. As the light passing through the monochromatic narowband filter, the observer does not need to have sophisticated apochromatic telescopes to put the filter, the use of a single lens telescope is the best possible solution. On the right image you can see the diagonal with the filter, together with the telescope used for our article. Note that the telescope has a fine tuning system for the focusing, this is verry helpfull when you are trying to image at those bands of the spectrum, cause the atmospheric conditions do affect more the UV light than the IR light. Untill now everyone knows that in order to do some imaging with web-cameras and other cameras like that you need a "UV-IR Cut" filter. In this case you can not use that filter at all. This is because the light from this telescope is verry close to the Ultraviolet, so if someone use the filter of CaK with the UV-IR Cut filter, he will see nothing at all. In this case we used a DMK 31AU03AS camera with no filters at all. This Camera is a monochromatic camera so she has more resolution and she is more sensytive in those wavelenghts. This is propably the most important section of the article. Now that I have everything together, what can I do with them ? First of all you must remember everytime you want to observe the Sun, not to do it without precautions. After that you need to understand that this filter is not so exsiting as the Ha' line filters, but can give you lot of pleasure if you can be patient. Lastly you must remember that if you have once done imaging in white light or Ha' with the same camera, it is the same way to image the Sun with a CaK filter. Observing at NUV of the Sun can be verry usefull to the schientific community, this is because many of the modern space missions (like So.H.O. and S.D.O.) are observing the Sun at almost the same spectrum bands. Also this is an area of the spectrum that shows you a layer of the solar atmosphere that is between the Photosphere and the Chromosphere. This is really usefull cause in this layer of the Sun you can observe active regions and phenomena not vissible in both the White Light and the Ha' filters, but also you can observe many phenomena that are the same everywhere. The most comon of them are the Sunspots. Sunspots can be viewed with every filter if they are big, or only at white light if they are verry small. Also prominences are vissible both, at CaK and Ha' filters. The interesting part of this case is that prominences change their shape - density - and evolution if viewed by those two different filters. Prominences seen through the CaK line filters, have a shape that looks more with the "AIA 304" filter of the S.D.O. space mission (see the picture beneath). Flares are seen through both of the CaK and Ha' line filters and sometimes are vissible also at the Wight Light (if they are extreme enough). In CaK line there are also vissible structures that look like the Photospheric "Faculae" but not the same ones. White light image (540nm) is taken with a 6" Acrh. Refr. and a Hershel wedge with a green 540nm filter of 7nm bandpass. NUV light image (393.4nm) is taken with a 60mm F/600mm Achr. Refr. 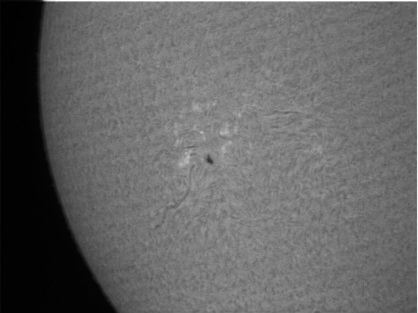 and a "LUNT" B600 CaK filter. Ha' light image is taken with a 40mm F/400mm Coronado P.S.T. telescope and a 2x Barlow.